Almonds make a nutritious snack or addition to recipes. 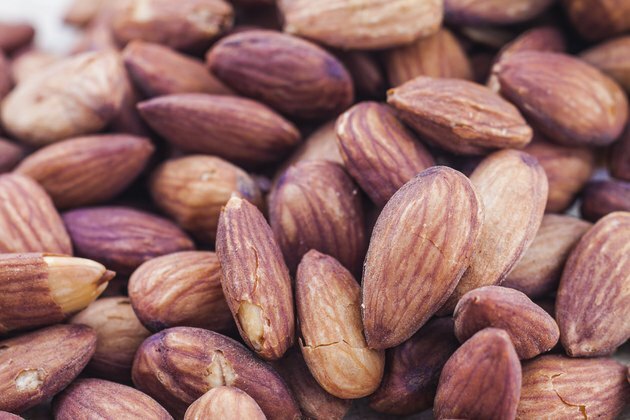 An ounce of almonds contains 35 percent of your recommended daily allowance of vitamin E, plus healthy fiber and protein. Roasting brings out the flavor of nuts. You can roast almonds quickly in your microwave, with or without additional fat. Eat roasted almonds as a snack, add to salads, main dishes, use as a topping for vegetables or mix into baked goods. Spray a microwave safe plate with cooking spray. Spread whole, chopped or slivered almonds on the plate in a single layer. Mix nuts with 1/2 tsp. softened butter or margarine per ½ cup nuts. This helps the nuts brown faster, but you can skip this step if you prefer not to add more fat to your roasted almonds. Microwave the almonds for one minute on high. Open the microwave and stir the nuts with a spoon. Stirring helps keep nuts from burning. Microwave an additional minute. Remove the nuts from microwave and check for doneness. The almonds are done when they are just beginning to brown. Slivered or chopped almonds should be roasted after two minutes. Whole nuts or larger quantities of nuts will need more time. Return them to the microwave and cook a minute at a time, stirring after each minute, until nuts begin to brown. Allow the toasted nuts to sit for one minute. They will continue to darken and cook during this time. Roasted almonds will keep in the refrigerator in a sealed container for one to two weeks. You can freeze roasted almonds for two to three months.